HG Logistics News Do You Keep A Journal? The other day a co-worker asked me, “Do you keep a journal?” I immediately, without hesitation, answered, “No. I only write when I have to.” I confess. I write these blogs mostly due to the fact that I was assigned the task by my general manager. I guess you could say it is part of my job description. So yes, my answer was quick, to the point, and unfortunately, honest. However, as the day went on, my mind kept wandering back to her question, and I became quite disturbed by my response. I began to question myself. Why do I have a negative prospective towards writing? Why do I look at it as a chore instead of fun? Why do I want to close my mind to the idea of writing instead of welcoming it as an open canvas to create whatever I desire? My mind then shifted to the thought of the power of words. Words are used to state a fact, share an idea, form an opinion, and express creativity and imagination. They are used to paint a picture, make music, and arouse suspense and interest. Words are the backbone, the voice of all communication. Words are Powerful! So why in the world would I not want to grasp hold of those words and use them as an expression of myself, especially when I have the freedom to do so? By this point my head was spinning. I can’t believe that one simple question could prompt such a sea of thoughts rushing through my mind. So why don’t I want to write? So why do so many of us avoid the art of the written word? Perhaps some of us fear revealing a part of ourselves and risk being criticized or judged. Perhaps it is because the written word is so forever, there is permanence about it. It is out there for everyone to quote, Google, copy, and paste. At least with the spoken word, we can hope that things we should have left unsaid will be erased from people’s memory banks or at least buried deep within their subconscious mind. However, the written word can be pulled out and read over and over again in remembrance of what we said. These may all be valid reasons why people don’t want to write, but I think more often then not, people don’t write because they don’t want to give the time and effort that it takes to put their thoughts on paper. I know I am guilty of this. However, one thing I have discovered from writing these blogs is that if you write about what you are familiar with or what comes from your heart, the words flow much easier and more fluently, almost effortlessly. That is why when you read my blogs that I write for HG Logistics LLC, a transportation broker and third party logistics company located in Cincinnati, Ohio, you get what you get, instead of blogs about the mechanics of maneuvering an 18-wheel, semi truck across the U.S. highways. I am not saying this subject is not worthy of blogging about. It is just that I am leaving that topic to be written by our expert panel of drivers. What I really found interesting is that a few days before my co-worker posed that thought provoking question to me, I had read an article in The Cincinnati Enquirer titled “Young, passionate and unusually talented.” This article that appeared in the Sunday, January 15, 2012 edition discussed a writing contest that was hosted by Enquirer columnist Krista Ramsey and the Chair of Mount Saint Joseph’s English and Modern Language Department, Elizabeth Bookser Barkley. The competition was for students ages 6 to 16. Teachers were urged to announce the contest but not to make it an assignment. They wanted those competing to do so on their own free will. Both Ramsey and Barkley were encouraged by the entries they received, and they each picked one favorite. Krista Ramsey chose Zoe Cheng’s essay, “When I Write.” Below I have included Cheng’s essay because I was so wowed by how she expressed herself, and she gave me the one answer as to why and how I should write–PASSION! Writing – it’s my life. It’s my home, my recluse, the lover of my dreams. When I write I lose myself in the arms of a dangerous thing – the red-rimmed eyes of time leave my head in wisps of smoke. This is what I feel when I write – an edginess inside of my heart that seems to glow and sparkle in a rapid build of emotion, I can feel the words and what they mean to me seizing my soul and painting brilliant, vivid shades of gold behind my eyes and I can taste that exquisite inspiration on the flesh of my tongue and my fingers tremble with the utmost anticipation and resolve and my smile is uncontrollable, random bundles of solid imagination bursting in my mind in a spontaneous array of fireworks as I set pen to paper and abstract thought to concreteness and I cannot describe to you how beautiful and poignant it is to see my words – my words – on paper and the notion that other people are actually understanding me and reading what I have to say and seeing it – seeing it. To me, writing is the one time I can speak my mind and not be afraid – when I write, I am bold and fearless and passionate and all these shades of red and I love it, I absolutely love it. My words are my wings and I use them to dream me away to fairy-dust clouds and glimmering woodlands, my words are my legs and I run run run to places only I can go – my words defy the boundaries of conformist society and the hurt and pain in my heart, because when I write, all of that – absolutely all of it – vanishes and I am flying, flying and it feels so good to soar. Zoe Cheng is only 14 years old, but she definitely has a gift for words. I hope by sharing her essay in my blog, it will inspire some of you to pen a few words of your own. Well, as I near the close of this blog, I once again find my mind wandering back to the question posed by my co-worker, and I could not help but think what Zoe Cheng would have answered if she was asked the same question. 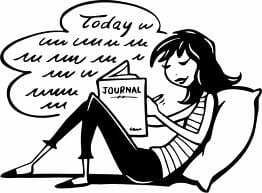 I am not a betting type of person, but I would lay odds that she keeps a journal and faithfully, with passion and joy, writes in it daily.